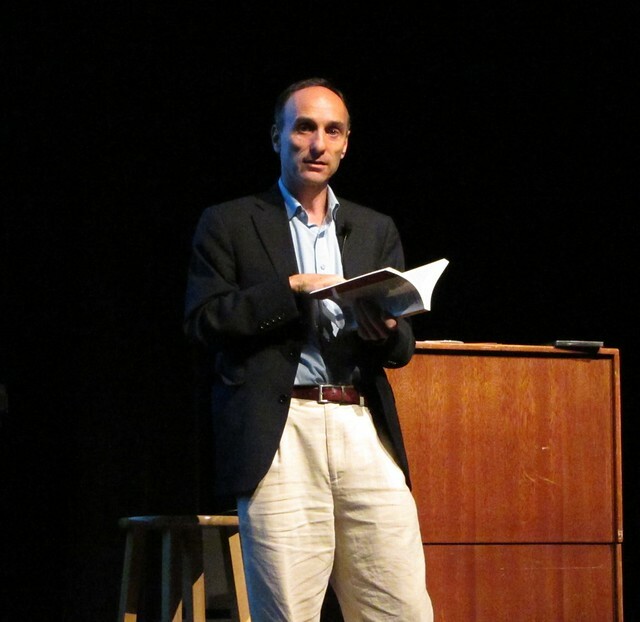 On Thursday, October 27th, UCSD hosted a lecture about genetically modified organisms (GMOs) by author Jeffrey Smith. Through his work investigating the risks of GMOs, Smith has become one of the world’s most prominent supporters of the anti-GMO movement. He has published two best-selling books on the topic, entitled Seeds of Deception and Genetic Roulette. The former tells the shocking stories behind the development of GMOs, and the latter presents the emerging evidence that reveals the true risks of genetically modified organisms. He has spent the last several years crisscrossing the country, educating the public about the risks of GMOs and how to avoid them. Last month’s event featured a general overview of the consequences of genetically modified organisms in our daily life. These GMOs include genetically modified corn, soybeans, cotton, zucchini and papaya, among others. Smith also presented his thoughts on how the United States may be approaching a ‘tipping point’ that will result in a sweeping change in public awareness and opinion on the issue. Smith believes that tipping point will culminate around the California Ballot Initiative that would require products containing GMOs to be labeled as such. Smith believes that an action such as this, directly opposing the GMO industry, could be enough to convince GMO companies to rethink their business practices. This could be the result of the rise in public awareness and consumer consciousness stemming from the vote at next year’s election. If you consider what issues matter most to the public today, GMOs are unlikely to come up. Smith emphasized this by saying, “on a scale of 1 to 100, most Americans are at about a -7 in terms of awareness of GMOs in their diet.” This is surprising to most people in the know about this issue since what we eat has a much more direct influence over everyone’s day-to-day lives than the majority of issues in the public eye. The consumption of GMOs has negative health effects for the consumer, contaminates the natural gene pool and poses a severe risk to natural ecosystems. These problems are real and receive very little attention. What’s most troubling is that these risks come with no real benefit for the consumer – the effort to develop and market GMOs stems more from greed than from health considerations or agricultural efficiency. Naturally occurring organisms cannot be patented, but GMOs are custom-made allowing companies to hold patents on their particular strain. This in turn allows them to charge more for their crop in the market, and when a handful of corporations control the percentage of the market made up of GMOs, this can lead to considerable profits for the patent holders. The US market figures are very telling; 91 percent of soy on the market is GM, 88 percent of cotton and canola, 85 percent of corn, 50 percent of papaya, and you can bet that GMO suppliers would like to see those percentages rise even more. So what’s the fuss? Are genetically modified plants really that different from the ordinary variety? Aren’t they being engineered to taste better, be more nutritious, or have a longer shelf life? The fact of the matter is the genetic modifications that go into the production of GMOs have little to do with benefiting the consumer. The majority of GMO modifications serve one of two purposes. The first modification is to make the plants more resistant to artificial herbicide. Essentially farmers can spray higher levels of herbicide on their crops, killing weeds without killing the crop. However, the corn or soy still absorbs the chemicals in the herbicide; they can just absorb more without dying, and these chemicals eventually end up in the food at our grocery stores and supermarkets, either in corn- or soy-based produce, or after being fed to livestock such as cattle. The other common modification is to give plants the ability to produce their own pesticides by introducing bacterial instructions for proteins that act as insect-killing toxins. A common example of this is to introduce genetic code for insecticidal proteins from the bacteria Bacillus thuringiensis, commonly referred to as Bt. The plant then expresses the bacterial genes and produces the bacterial proteins, turning the plant itself into a pesticide factory, killing insects that would otherwise harm the crops. These pesticidal plants are not only toxic to insects, but have also been linked to health problems in mammals. Buffalo in India were sick or unconscious after 2 days on the GMO diet, and dead after 3 (expand quote). Other experiments have shown that when given the choice, animals opt to eat natural food rather than genetically modified strains. During the 90s, genetically modified ‘FlavrSavr’ tomatoes were tested on rats, showing that rats preferred ordinary tomatoes and avoided the genetically modified ones. Thirty-five percent of the rats that were made to eat the genetically altered tomatoes developed stomach lesions and became very ill. Seven out of the 40 rats died within the first two weeks of the four week study. Despite this, the product was approved for US markets, and was only eventually pulled from the market because the tomatoes didn’t taste as good as normal tomatoes and weren’t expected to sell very well. In yet another study, mice were fed either genetically modified Bt-potatoes, regular potatoes, or a combination of regular potatoes and insecticide. The only group of mice that got sick were the ones fed Bt-potatoes, suggesting that something about the process of genetic alteration made the mice sick, since the group on the insecticide diet stayed healthy. In Australia, GM peas were shown to produce a protein that could cause anaphylactic shock in humans, but at that point the peas had already passed the necessary health regulations to be commercially sold. On top of that there are many possible ecological risks. Pest resistant Bt-crops have the potential to proliferate beyond agricultural lands and become super-weeds without the natural checks of insect herbivores. Overexposure to Bt pesticides from GM crops could lead to whole populations of Bt-resistant insects that would be more difficult to tackle with more conventional pesticides, just as we’ve seen with antibiotic overuse and the proliferation of resistant viruses. Besides these studies, a myriad of other potential health risks have been described. On his website for Seeds of Deception, Smith points out that “there are a number of dangers that broadly fall into the categories of potential toxins, allergens, carcinogens, new diseases, antibiotic resistant diseases and nutritional problems,” as well as infertility and accelerated aging. If all of these significant health risks are being discovered, why are the products are still ending up on the market? In Europe they aren’t. When the news broke in the UK about how dangerous GMOs are to human health, there was public outcry across Europe, leading to bans of GM products, and the market for GMOs basically vanished. Over 30 countries around the world require labels to be placed on products that contain GMOs. The United States hasn’t seen the same level of high profile coverage of the issue. The FDA policy for the approval of GMO products was written in 1992, and is summarized by the statement, “The agency is not aware of any information showing that foods derived by these new methods differ from other foods in any meaningful or uniform way.” This policy was in contradiction with what the FDA’s own researchers had found in their analyses of GM products, but the policy was issued anyway. This makes more sense when you realize that the FDA’s Deputy Policy Commissioner at the time, Michael Taylor, was previously an attorney for key GM company Monsanto, and later went on to work for Monsanto again after his time at the FDA. Under Taylor’s guidance, the FDA routinely ignored reports about any negative effects of GM foods, paving the way for extremely lax policies surrounding the launch of new GM products, in spite of numerous troubling reports on the health risks of GMOs from within the scientific community. So as it stands there is currently little to no safeguard to protect American consumers from the potential risks of genetically modified foods. GMO foods pose health risks, have zero benefits to consumers, jeopardize ecosystems, and are generally less nutritious than non-GMO counterparts. When people are aware of these facts, they are vastly more likely to avoid GMO products in their diets. Several sections of the public already show marked opposition to the GMO industry, including parents and children, people who are overweight, medical professionals, cancer survivors and athletes. Since 2010, Smith has encountered more receptive groups of informed, enthusiastic, and active citizens participating in the anti-GMO movement than ever before. 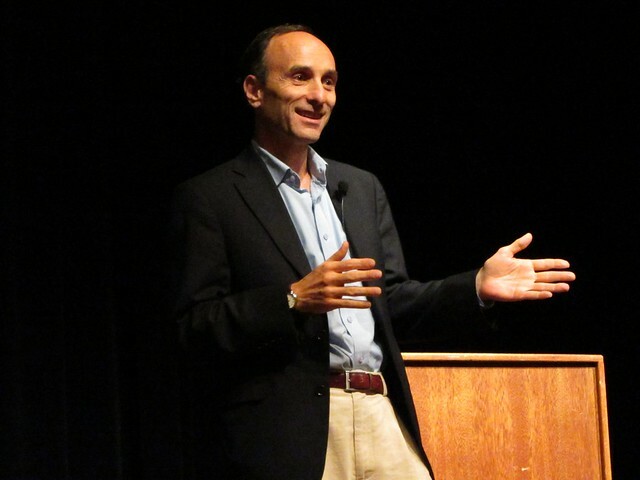 Smith pointed out that a December 2009 article in Supermarket News (a periodical for food industry executives) reported that GMOs might soon join the ranks of such culprits as transfats, carbs and extra sugars as qualities for the health-conscious to avoid. In fact, some of the fastest growing food products in the country over the last couple of years have been verified as non-GMO, and marketed as such. All of these factors, from increased public action to awareness in the food industry, lead Smith to believe that we are approaching the aforementioned ‘tipping point’ that could spell the end of GM foods in the US, just as Europe’s ended in 1999. With the California ballot initiative shoving the GMO issue into the media spotlight, and the increase in public awareness and discussion that is bound to follow, 2012 could be the year to watch for the tables to turn on GM foods. Smith believes that the United States is on a strategic platform; any shift in policy that results from the tipping point in California can be leveraged to protect the world’s food supply. The evening’s final thoughts were that these circumstances in California offer opportunities that we must make the most of. If you want to find out more about GMOs, take a look at Jeffrey Smith’s Seeds of Deception article, the Online Non-GMO Shopping Guide and the Label GMOs campaign website. Thanks for covering this very important issue.